Catalogs or Collections are administrative lists with inconsistent relationships to physical items. Therefore, a Cataloged Item is an abstraction, i.e., it is an item that has been cataloged, and hence defined, by the administrator of a catalog. The term “specimen” is used synonymously with “cataloged item” throughout Arctos. Catalog Number is the identifier assigned to a Cataloged Item. It must be unique (case-insensitive) within a particular catalog. Arctos currently supports three formats of catalog number. Integer: Catalog numbers must be positive integers. Arctos provides tools to predict the next number (e.g., data entry can leave catalog number blank), find gaps in sequences, search by ranges, clone full records, and provide GUIDs of the “expected” format. Sort may be numeric (1,2,,3…20). Only this format comes with these tools and abilities, and it is often worthwhile to convert existing mixed-string catalog “series” to Integer catalog numbers and store the old numbers as other IDs. Prefix-Integer-Suffix: An integer is required, and may be accompanied by a prefix and/or suffix. The concatenation of prefix-integer-suffix must be unique. No predictive tools are available. Search is by the concatenation or substrings thereof. Sort will be character (1,2,…20…3). String: Any unique non-NULL string is accepted. No predictive tools are available. Search is by the string or substrings thereof. Sort will be character (1,2,…20…3). Characters “/” (forward slash) and “ “ (space) are currently prohibited. A code table is available to explicitly label various types of cataloged material. Agent creating the catalog record in Arctos. Date on which the record was created. Agent last editing the catalog record. Date on which the record was last edited. Flags mark a specimen as missing information during the entry process. It is sometimes more convenient to bulkload data after the specimen record exists than to enter data with the specimen; flags serves as a marker to facilitate easily locating those specimens. Free-text description of species associated with the specimen. Catalogs are most usefully defined by way of a GUID Prefix, which in conjunction with catalog number forms a unique identifier within Arctos, and in conjunction with Arctos’ URI forms a Globally Unique Identifier (GUID) for the specimen record. GUIDs, once formed, must never be allowed to change or expire. See deleting specimens for guidelines. All specimen citations should occur by way of GUID. Note that while GUID Prefix generally appears to be a concatenation of institution and collection code, it is in fact an independent concept; several collections from an institution may use the ‘Herb’ collection_cde (e.g. for vascular plants, cryptogams, and marine algae collections, for example). Collection Code links catalogs to collection-type-specific code tables. Values are generally descriptive (“Mamm” or “Bird”), but no deeper meaning exists. Existing collection_cde values are in a code table. Exploring the “filter” option of Attribute Type will provide an idea of how a collection type has been used. Abbreviation of the institution that hosts the catalog. For example, “MVZ” for Museum of Vertebrate Zoology, “UAM” for University of Alaska Museum (of the North), “MSB” for Museum of Southwestern Biology. Generally, these values are the same as those traditionally used for specimen citations within discipline-specific publications. There is now a demand for globally unique specimen identifiers on the Internet, and at least one registry for such abbreviations has been established. From SpecimenSearch, Catalog Number accepts arguments of several forms. The following table is illustrative. 12 12 No-operator inputs are string matched. 12-14 12, 13, or 14 Dash-separated smaller–>larger integers specify a range. Note that there is a 1000-item limit on ranges and lists. =12-14 12-14 ”=” (equals) prefix overrides all other operators and assumptions; only a matching string is returned. 12-11 12-11 “Second” item is smaller than “first” item; not considered as range. 12-0110 12-0110 “Second” item is zero-padded so not considered an integer; not considered as range. 12,13,14 12, 13, or 14 Commas are treated as list delimiters unless the value is prefixed with an equals sign. Note that there is a 1000-item limit on ranges and lists. 12,13a,14 12, 13a, or 14 Commas are treated as list delimiters unless the value is prefixed with an equals sign. Neither catalog numbers nor list elements must be numeric. Note that there is a 1000-item limit on ranges and lists. %12% 12, 121, 12a, 999483612345, …. ”%” is “match anything.” This matches anything CONTAINING 12. %12 12, 112, AABC-5-a12, …. ”%” is “match anything.” This matches anything ENDING WITH 12. 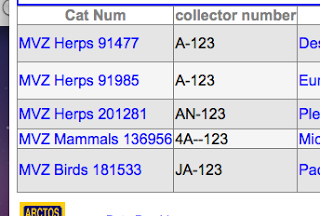 Each specimen in Arctos receives (and is define by) a single catalog number, along with any number of identifying numbers, often referred to as “Other IDs.” There are several ways, each with their own limitations, to search these numbers. The data available for searching vary wildly based on what collectors have recorded and what collections have entered. Some exploration is often involved in finding a particular set of specimens. Along with catalog numbers, Arctos provides the capacity to attach any number of identifiers of various types to specimens. Other Identifiers, like catalog numbers, have three components: A prefix, an integer, and a suffix. Individual collections define how these components should be used, acceptable values, and how data are to be entered, and these decisions affect what sorts of queries are possible. It is often not possible to deduce these rules and practices – contact us if you need help. To get Other ID search, click More Options on the Identifiers pane of SpecimenSearch. This will provide options to select Other ID Type and to provide an Other ID Number. (We generally use “number” in the sense of a license plate rather than an integer.) Additionally, you can choose whether the number is an exact match or a “contains” match. Exact match searches are case-sensitive. It’s often unclear what type of ID might have been assigned to a number, and the descriptions currently do little to clarify that problem. It is therefore possible (and often most practical) to search by the number component, entirely ignoring ID Type. containing the string 123. As of this writing, that search returns 9330 specimens. Additional criteria, coupled with Arctos’ sorting capability, is hopefully enough to find the specimen data of interest. The “in list” option accepts a comma-separated list of values. The in range option works only for enforced-integer types of identifiers (currently only AF and NK). Attempting to use it for collector number will result in a datatype mismatch and return an error. to send SQL customIdentifier.other_id_number = 1234. This is a numeric match of the numeric part of other IDs. It will not find specimens which have the numeric information entered into prefix. This information is not available to public users, but is evident from the edit form. This specimen will NOT be found with the previous search! We address assigning catalog numbers to material with a few brief examples. In short, we strongly recommend cataloging the item of scientific interest: the material that Researcher #2 will ask to borrow for confirmation when they find your citations in GenBank or publications. Any other approach complicates tracking citations and data management. We present as example a brief list of things that may be cataloged in Arctos. Standard practice in vertebrate collections, and the method we strongly encourage when possible. Biological individuals are generally the item of scientific interest, and the thing a future researcher will wish to examine if attempting to replicate results. Common practice in vertebrate collections, but makes locating or citing a parasite more complicated and less reliable than it needs to be. Rather, we recommend cataloging the host, cataloging the individual parasites (or donating them to someone who can), and establishing proper relationships. While lots are a convenient and sometimes necessary ”working group,” (e.g., due to the number of individuals involved or the available expertise in identification) we strongly discourage making lots available for citation. Insect collections often loan lots, and the borrowing researcher will sort the lot to individuals for which they are provided catalog numbers, a situation we find acceptable. Attaching cryptic and fragile “individual tags” to members of a lot when someone uses a specimen for molecular analysis makes little sense to us. This situation inevitably leads to confusing citations and bad science when an individual sampled multiple times at multiple locations is assumed by users to be multiple distinct individuals. Arctos supports cataloging encounters as specimen events under one cataloged item. Similar to occurrences in that this leads to multiple identifiers being assigned to an individual (and potentially the two being compared in a study), this should be avoided when possible. When unavoidable, both systems should support resolvable identifiers and link to each other, and specimen downloads should include the relationship. Arctos also adds a distinctive style to “same individual as” specimens. This denormalization of data inevitable leads to divergence and confusion (not to mention increased curatorial workload), in addition to the aforementioned implications of assigning the item of scientific interest multiple primary identifiers. Having reconciled the data in similar systems, we cannot possibly be vigorous enough in discouraging the continuation of such methodology. We include this to stress the fact that cataloged items are wholly arbitrary concepts assigned to whatever someone wanted to catalog. That is, the scientific value of a cataloged number is entirely up to the person deciding upon the material to catalog. Collections in Arctos are wholly administrative. Collections may be comprised of similar taxa (e.g. mammals), of various taxa organized for some purpose (such at the Hildebrandt Collection at MVZ), by legacy usage, or anything else. The sole functional or technical consideration is code tables, which are tied to collection type (collection_cde). For example, contrast Attributes available to a Mamm collection versus a Para collection. Legacy collections often exist for various reasons, and these may have duplicate catalog numbers, unpredictable formats which may confuse users, or contain arbitrary divides which no longer make sense. Combining these into a unified collection in Arctos is generally trivial, and Arctos provides various mechanisms (such as actionable identifiers and redirects) to ensure that no functionality is lost. Collections with “less citable” catalog number schemes are unlikely to support actionable citations, and so little is lost if the “traditional catalog numbers” are subsumed under a “citable catalog number.” This approach has been used to unify and disambiguate several Arctos collections; we find tradition little excuse to go forward under systems which discourage good science. Encumber the record(s) to be deleted. Create an appropriate encumbrance first, if necessary. Records may be flagged from individual specimens, or en masse by using the Manage widget from Specimen Results of a search. Once records are flagged, they may be deleted by users with the appropriate privileges. Find the encumbrance (under Tools). Click See Specimens and carefully review what you’re about to delete. From Manage Encumbrances, click Delete Encumbered Specimens. You’ll again be asked to review your decision, and must click the proceed button at the bottom of the page to delete the records from the database. Note that there may be reasons to keep masked records in the database instead of deleting them. Arctos provides HTTP redirect capability, under which one URL (http://arctos.database.museum/guid/KNWR:Ento:7193, for example) can be automatically redirected to another (http://arctos.database.museum/guid/UAM:Ento:228334). This helps in maintaining a record of the specimen rather than the specimen’s identifying numbers, and allows users to continue using bookmarks and links. Insert into table REDIRECT (Manage Data/Tools/Redirects) old and new paths. For example, if DGR:Mamm:123 is recataloged as MSB:Mamm:456, enter: old_path=/guid/DGR:Mamm:123; new_path=/guid/MSB:Mamm:456. Other ID documentation has moved to it’s own page.